Every one of Colorado’s 333 local jurisdictions is responsible for adopting its own local building code. That diversity gives us a comprehensive picture of how energy codes are perceived, considered, adopted, amended, and enforced across different parts of the state, and how they change over time. Here are five trends we’ve seen shaping the status of our energy codes in Colorado so far in 2018. These themes appear in many other home-rule states, too, so Colorado’s experience can be highly informative to builders and policymakers outside of the Centennial State. 1. Almost every high-construction area is on the 2015 energy code, or moving to the 2018 energy code (with a few exceptions). The two most recent and most efficient versions of the International Energy Conservation Code (IECC)—the 2015 and 2018—are becoming common and well-accepted in almost all of the high-construction parts of this fast-growing state. From the Colorado Energy Code Compliance Collaborative’s survey of energy codes, we count 51 Colorado jurisdictions on the 2015 IECC and another 21 in the process of adopting it. At least another 17 tell us they’re planning to adopt the 2018 IECC. A few dozen more jurisdictions follow the 2012 IECC, which has similar efficiency levels and requirements. All told, at least 122 jurisdictions get the benefits of healthier, safer, more cost-effective, and more efficient homes and businesses. This tally includes nearly all of the high-growth areas of the state—Denver and the metro area, Fort Collins, Boulder, Colorado Springs, Pueblo, Durango, Grand Junction, Gunnison, the mountain resort towns, and many of their nearby neighbors. A few of the jurisdictions haven’t yet joined their 122 peers in advancing their energy code: the cities of Alamosa, Greeley, and Windsor are still back on the 2009 energy code, while Adams County and the cities of Salida, Sterling, Brighton, and Delta still use the 2006. 2. Rural areas get left behind. Unfortunately, contrary to the first trend, many rural areas in Colorado are stuck on earlier, often far-outdated codes, with little impetus to improve. But the longer they wait to adopt newer codes, the harder it will be for them to make the jump. 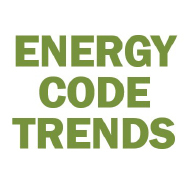 The Colorado Energy Code Collaborative’s same survey of energy codes shows that the towns of Del Norte, Evans, and La Salle all use a 1977 energy code, while Fairplay is on the 1976, Wray is on the 1967, and Julesburg is on the 1965. And some 40+ jurisdictions appear to have no building codes whatsoever (much less an energy code). We hear several reasons for this: The small towns don’t have enough raters in the area to do air leakage testing (mandatory starting in the 2012 IECC), but raters won’t go to these more remote places without more demand for their services. The communities also say they don’t have the staff time or resources for hearings or enforcement. Builders balk at changing their methods or techniques to build tighter and more durable homes, or they resent the added up-front costs (although the homeowners recoup those costs year upon year). Still, even though construction activity in these areas is low, we feel badly for homebuyers in those areas who are assuming—but not getting—the assurance of a bare-minimum standard of durability, quality, health, safety, and ongoing affordability. 3. Some jurisdictions are updating every-other code cycle (every six years) instead of staying up to date. Although the International Code Council (ICC) updates the model energy code every three years, many Colorado jurisdictions are adopting new versions only every six years. These jurisdictions say that although the codebooks themselves can be pricey, the real expense comes from the costs of hearings, stakeholder meetings, public notices, staff trainings, and education of local architects and builders on upcoming changes. This goes for all building codes, not just the energy code. In our quarterly Colorado Energy Code Compliance Collaborative, we’ve heard a number of building officials say they wish the ICC’s model codes had a new edition, say, every four years instead of three, and then their communities could afford to stay current. Nevertheless, we recommend that even smaller communities keep their energy codes up-to-date. For one thing, the Colorado Energy Office and Xcel Energy offer technical assistance, and free and customized trainings for new code adoptions, which make the process easier. In addition, the changes between each code cycle are typically rather minimal and easier to learn, whereas they add up considerably with more elapsed code cycles—requiring more training and likely encountering more pushback from local builders. 4. Neighboring jurisdictions are working together on common adoptions and amendments. Compared to years past, SWEEP has seen the encouraging trend of more neighboring communities banding together to evaluate the new code, discuss common amendments, and get on a similar adoption timeline. This makes practical sense: neighboring communities share many of the same building conditions, builders, contractors, and costs, as well as similar consumer expectations. Builders also find code compliance easier if the requirements are the same as across the street in the next jurisdiction. That uniformity, in turn, helps buildings departments see better compliance. Building departments and prominent local builders are all finding it helpful to talk through challenges and changes in a new code together and discuss cost-effective ways to meet them. For example, metro Denver’s southern and southeastern suburbs are working together on reviewing the 2018 I-Codes and adopting common amendments, with the goal of full adoptions by 2019. They plan to post their common amendments on the Colorado ICC Chapter’s website. Jurisdictions in the southwestern corner of the state are also working together. The Colorado Springs-area jurisdictions already all adopt the same code through the Pikes Peak Regional Building Department, which is in the process of adopting the 2015 IECC. On the Western Slope, jurisdictions in Mesa County remain consistent through the regional building department. The Summit County area implemented a similar, coordinated approach nearly a decade ago by hosting stakeholder meetings of the region’s builders and code officials—and Summit County officials still talk about how the cooperation has boosted the quality of construction. 5. EV-Ready and Solar-Ready enter the codes. Finally, we’re seeing increased adoption and acceptance of two new building code amendments: electric vehicle-ready and solar-ready requirements. “EV-ready” and “solar-ready” essentially mean the new home or building will have sufficient electrical panel capacity for a future car-charging station or solar energy system, and will have wiring or conduit from the electrical panel to the EV-charging or solar-power system location. Running wiring or conduit during new construction is far easier and cheaper than undertaking a major renovation effort later. Upgrading the electrical panel upfront also saves the homeowner or building owner the cost of changing it down the road. Denver, Aspen, Boulder County, and the City of Boulder all have added EV-ready and/or solar-ready requirements as amendments to their codes. (These usually fall under the International Residential Code or International Building Code, not their energy code). The Colorado Energy Office will be offering trainings and technical assistance for communities that want to add these amendments.